The UV inks used by Vispronet® in digital printing are VOC-free and certified according to the Nordic Ecolabel (Nordic Swan). In our manufacturing process we use environmentally friendly water-based dispersion, pigment dyes and sublimation inks. Vispronet® sledges and deck chairs are exclusively made of wood from local forests bearing the FSC® label. 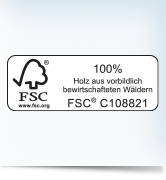 This seal guarantees an ecological and above all sustainable forest management. Biodiversity is specifically promoted, clearance and the use of biocides are prohibited. "Preserving through responsible use" – according to this motto we contribute to safeguarding the long-term sustainability of the forest and its biodiversity. We work according to the principles of effective environmental protection and follow the guidelines of the environmental management systems EMAS II and DIN EN ISO 14001. The effective use of media is ensured by regular consumption analyzes. Constant monitoring of the technological parameters in the production process ensures the economical use of gas, water, electrical energy, chemicals and minimizes the amount of waste.